In the year 2009-10, Government of India declared free and compulsory elementary education for all children between 6 and 14 years of age, through the Right To Education (RTE) Act. Door Step School (DSS) was already working for education of children in and around Pune city, who were left out of formal schooling system due to various reasons. An opportunity was identified through the RTE Act, to help many out-of-school children in getting enrolled in formal schools. The Every Child Counts (ECC) campaign was thus launched in Pune in year 2011. Surveys were conducted of temporary slums, construction sites, brick kilns, and other such communities where out-of-school children could be found. These children were taken to nearby government schools by creating awareness among their parents. The ECC team also followed up to ensure that these children are attending schools regularly. 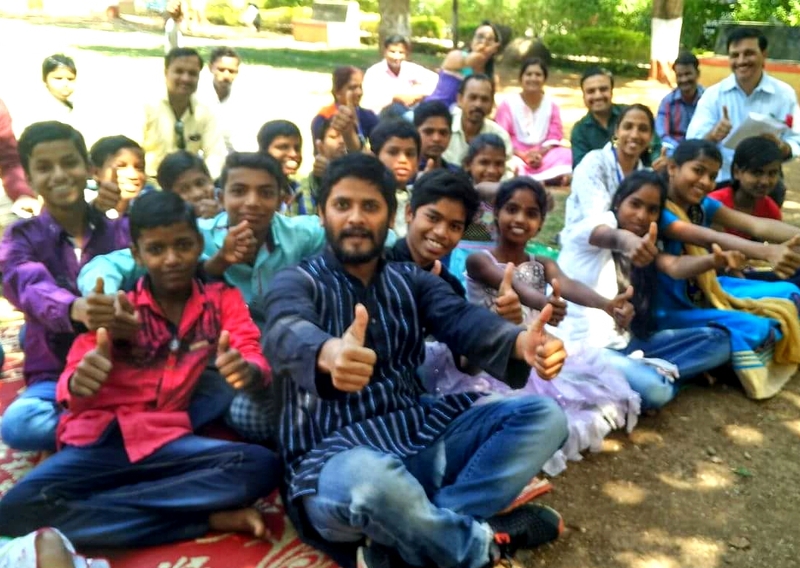 Recently, a get-together was organized by Door Step School, for children and parents from migrant communities in Vishrantwadi and Dhanori areas within Pune Municipal Corporation (PMC) limits. These children were enrolled in government schools between 2013 and 2015, and they have continued their education through last three years. The team identified 28 such children in this area and approached their parents for the get-together. A total of 18 children and 8 parents attended the programme on Sunday, 5th of March 2017 at Ayyappa Garden, Dhanori. The idea was to appreciate and encourage these children and parents for continuing education despite all odds. The children spoke about their experience of starting to attend a formal school. Many of them were first generation learners, with no background of education at home. Almost all of them mentioned that they were first afraid of entering a school and did not even know the local language, Marathi, at that time. They were also worried about how other students and teachers would treat them. The new surroundings were daunting and fear of rejection was very real. One of the children, Renuka, was enrolled in 3rd standard according to her age that time. Initially, she was not at all interested in school as she could not understand anything taught there. However, the teachers helped her overcome the initial hurdles and she has now reached 7th standard. Her parents had to migrate frequently due to nature of their work. But very soon they realized that this is causing disturbance in Renuka’s education. Hence, they took a room in this area on rent so that the family could stay at one place through all these years. Renuka is now very much interested in attending the school and studying various subjects. She wants to become a teacher when she grows up. When asked the reason, she replied that she wants to educate other girls like her and help them become independent! Gangaram Rathod was also enrolled in 3rd standard in a nearby government school. His parents had migrated from Bihar to Pune in year 2013 in search of employment. Since the family was struggling for survival, education of the child could not be a priority. Even when the ECC team approached these parents for Gangaram’s school admission, they said that we are here only for a short while and will move back to our native place soon. They also kept saying that Marathi is not our language, we will send our children to a school in our village when we move back. The team persistently followed up with the parents and enrolled Gangaram in 3rd standard according to his age that time. The family still lives in Pune and Gangaram is now in 7th standard. This year, we arranged a bicycle for him for commuting to school everyday on his own. His parents are now keen to continue his education. Their job demands them to migrate frequently, but they are now looking for a hostel for Gangaram so that his education is continued. Gangaram aspires to pursue higher education in computer engineering. There are many other children like Renuka and Gangaram, who needed the initial support to start their education. Now they are fond of school, have learnt and mastered the local language, and have also made local friends. The parents took some time in believing what ECC team was telling them. But eventually they were convinced that only education can bring positive change in their children’s lives. The parents were happy and proud of their children dreaming big and progressing in that direction. They do not want their children to struggle in the same way they have done throughout their life. The parents realize that dreams of their children are too big, but they at least expect them to be skilled workers and get assured jobs instead of being mere labourers on daily wages. The children and parents both are now ready to face any challenges coming in the way. There were few fun games for the parents at the event. Children were happy to cheer up for their parents, and the parents played and won and fought like children. The get-together also included a storytelling session by Mr. Ajay Dasgupta of The Kahani Project. He gave the children few insights on what they can do today instead of waiting to grow up for doing something. 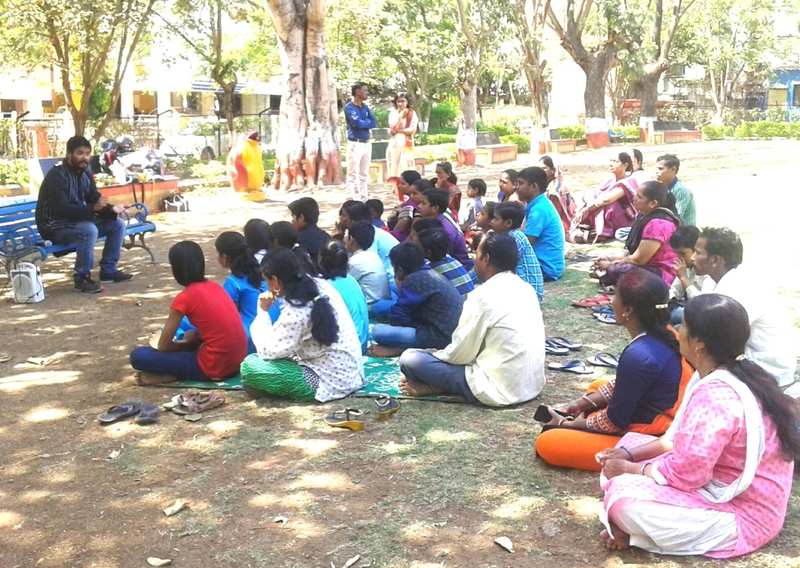 Children and their parents equally enjoyed the story told by Ajay, which taught children how to face and conquer fear. Ajay advised the children to convert their biggest fear into their best friend, so that they can achieve anything in life. The children continuing their education throughout these years were felicitated along with their parents. The ECC team believes that this kind of interaction helps strengthen the trust and build up the confidence, bringing positive change in parents’ approach towards children’s education. A similar get-together was organized for another group of children enrolled from Bhosari, Dighi, and Moshi areas in Pimpri-Chinchwad Municipal Corporation (PCMC) limits. This programme was held on 26th of March 2017 at Bhosari Garden on Pune-Nashik Highway. 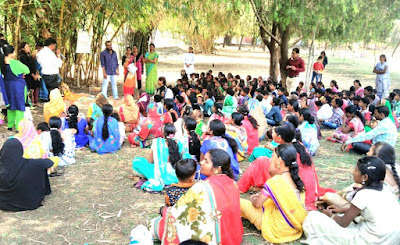 Around 70 parents and 107 children from 15 locations participated in this event. The parents are daily wage labourers, mostly coming from other states. After persistent efforts by the ECC-PCMC team, the parents have realized importance of education in their children’s lives. In spite of uncertain nature of work, they are now staying at one location since last couple of years, so that their children can continue attending the school they were enrolled into. Even children from highly migrant communities in Phuge Vasti and other areas are now seen regularly going to schools. Volunteers from Wipro and few other individuals helped the ECC team in organizing games for children and parents at this get-together. We hope to see many more children get into mainstream of formal education and continue attending schools by overcoming the challenges thrown at them by life. Door Step School is all geared up to help them progress towards achieving their dreams.